Stroking my Banshee for Kenny. Discussion in 'Some Assembly Required' started by Wildebeest90210, Jul 27, 2017. I can't remember where the idea came from but I had just sold some gear and needed to turn the cash in to metal before it turned in to soft furnishings so I started to talk to Banshee tuners in the US. We never got the Banshee in the UK so it was all new to me, all the quality up-grades got me more than a little excited. I had a 350 YPVS as a young hooligan and was mighty impressed so the sight of all this tuning gear was irresistible. I ended up dealing with Roger at wicked motorsport Ca. who shipped to Larryboy who added FREE OF CHARGE! an RZ350 motor and then shipped to me in the UK. So this is my haul, a 421cc stroker conversion and a motor and gear box to build it in to. I could not be happier . Richarde1605, busa1300, brucifer and 11 others like this. So I want a 120KG (265lb) bike with a 80+hp banshee motor in a champion replica frame. I have a wish list, I intend to build the motor first and then worry about raising funds for the rest. I do reserve the right to change my mind completely and build a drag bike/ land speed mind you but unlikely. So I have a title and Co-built (local to me flat tracker builders and more) can build me a light weight chromoly frame, it will be a road bike. I really want these Marvic Morris magnesium wheels, they used them on TZ750 road racers. I will need to sell a vital internal organ to get them but that is a small price to pay. With a period style disc of course. And these 38mm Ceriani replicas are available in magnesium with a 'if you need to ask?' price tag. Maybe the wife has a spare kidney. busa1300, alvincullumyork, Te Hopo and 5 others like this. So here are some details of my stash. The cylinders are made by CPI in the US, for quad bike racing really. The serval cub is a single casting with liners 3mm over from stock and built for a 4mm stroke increase. The porting is timed for a good basic spread of power, all the quad racers port the crap out of them 'you need my one off dune tune man!'. Well I don't, I need to stay alive. The cub designation is already tuned so the serval was to me the way to go. Velocipede, Te Hopo, JagLite and 2 others like this. The 421cc conversion is the largest you can go without machining the cases. 35mm PWKs, you would usually use 34mm but there was a stock problem so I'll just have to live with the extra mm. V force reeds, 8 petals vs. 4 and carbon too. Nice. Te Hopo, nuggets, waylongway and 4 others like this. These triples I bought a while back with the intention of using them on this bike. 38 mm, Italian I think, very light. Need some cleaning up and handlebar clamps made but I do like them. Another for the wish list. Maxton, who supply the ceriani rep forks do these which I must have somehow..
internalcombust, Te Hopo, Tallbastid and 8 others like this. Subscribed. This will be a wicked build! Wildebeest90210 and JCool like this. anonny What could go wrong? Does that engine run on pre-mix or does it have an oil pump? Also does this mean your Metisse is on the back burner? I'll junk the oil pump and run it pre-mix with this stuff. It smells amazing, I run a drop in my lawn mower even though it's a 4T just for the smell. Metisse is all back together and riding, if it ever stops raining that is. I do have to finish the bored tracker to sell to pay for the frame to be built. wmfleet2, Te Hopo, BIG-E and 1 other person like this. Mitaka heavy duty clutch and new basket with some bits and bobs from Yambits UK and all the original Yamaha stuff from Fowlers. Both excellent, order on line with live chat and next day delivery. Wasn't expecting that, will have to do some dirty work and get the cases cleaned up. alvincullumyork, GR0NK, nuggets and 3 others like this. alvincullumyork, GR0NK and Wildebeest90210 like this. That will certainly be an entertaining ride! Co-Built stuff if really, really nice kit. I have a set of their yokes/trees for my little project. Personally I always thought the Champion body work looked "old fashioned" and always preferred the "Knight" style bodywork. This a UK rep with a proper TZ motor but with the Knight (wrong!?) body work. I've looked at this bike and wondered, if you had a TZ750 motor for a replica why would you not replicate. alvincullumyork, Benduro, Te Hopo and 5 others like this. Just a personal preference and your right, if I was to build a replica of Kenny's bike, I too would do it right with the Champion bodywork. 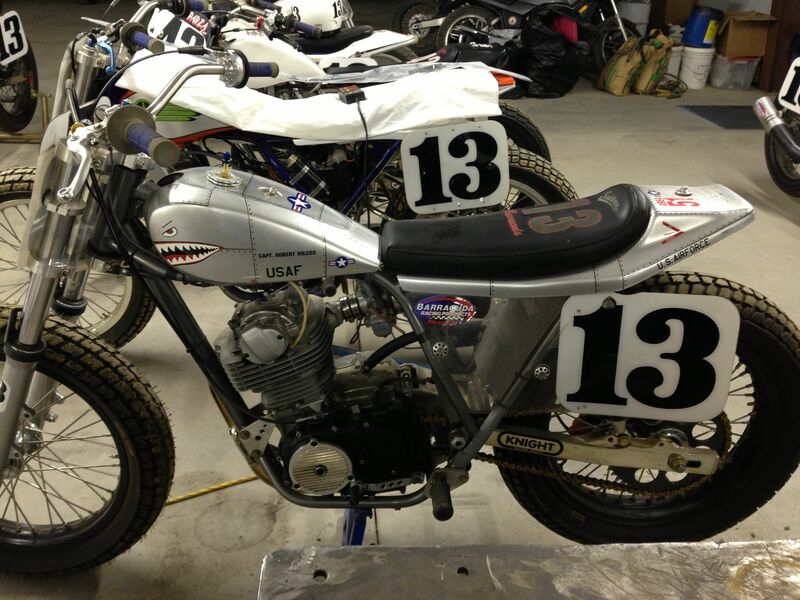 Oh and that's not a knight pattern seat, it's a modified XR750 one! I like pretty much all of the flat track seats, the XR style used to be my favourite, I'm not so sure now. As for tanks, first of all that RD tank does not work with the top TZ, I bet it's got a good range 'though. The Champion tank is a bit angular for my tastes, but it works well with the seat obviously. I still really like the original shape XR tank and quite like the later one too, very limited range with any of those. GR0NK, JagLite, dpforth and 1 other person like this. this is gunna be GOOD!!! Fast Idle and Wildebeest90210 like this. Investigated my clutch today for new basket. Just reading up recently I found out all sorts of stuff is going on in there, I had no idea. So I ordered new damping rubbers and drilled my way in. The new basket is a few grams lighter and 7075 T6 with a hard anodise no less! They do screw together rather than rivet which makes for an easy assembly. alvincullumyork, Roadracer_Al, nuggets and 2 others like this. This is a way cool project. What a great build this should be. Makes me want to ride it already! Congrats. You're right, who doesn't want one! I was fortunate enough to visit A&A Racing in San Carlos some years back and met Ray Abrams, the master who built many bikes for Kenny. It was a jaw dropping experience to see all the vintage race bikes he had built through the years and I'm sure i saw just a fraction. wmfleet2, Roadracer_Al, waylongway and 3 others like this. You might enjoy this article about the above bike. It was scary fast at 140hp and 320 lbs. Current value is over $100k. I'm sure your build will be awesome and plenty fast. It's a great plan you have there! Going to be fun watching this thread for sure.